Setting up Auto Union was a dream come true for Simon and John who are both full on petrol heads! We are so unbelievably passionate about the look, feel, smell and the atmosphere, which classic and prestigious cars and motorcycles bring to us. We both come from motoring backgrounds and have been in the industry over 30 years. Over that time we have amassed great knowledge in both classic & prestigious cars and motorcycles. This has come from not only our line of work but our own collections, which started from a Ford Anglia to a Ferrari 458 and a Suzuki GT750 to Ducati Desmosedici. We have bought and sold a fantastic mix of cars and bikes between us. 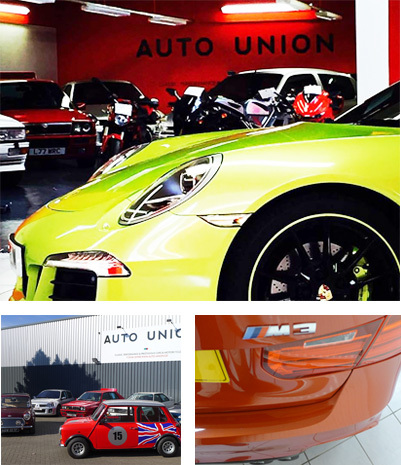 We have now setup Auto Union which is both bespoke and unique which is set in a clean, friendly environment to showcase our classic and stylish cars and motorcycles. Our company philosophy is to buy the best example, with the best originality at the best possible prices so like-minded enthusiasts can experience the joy and happiness that these moving works of art can bring. Both of us consider ourselves to be custodians of these vehicles not owners. We want to ensure that these magnificent vehicles continue to grace the roads for many a year to come.